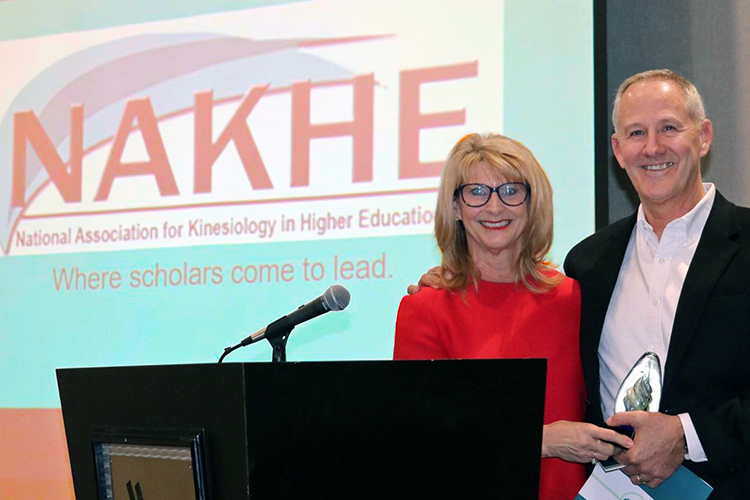 A national organization for educators specializing in kinesiology has bestowed its highest award on an MTSU professor in the Department of Health and Human Performance. The National Association for Kinesiology in Higher Education presented Dr. Steven Estes, who also serves as director of the College of Behavioral and Health Sciences’ Leisure and Sport Management Graduate Program, with its President’s Award Jan. 10 at the group’s annual convention in Savannah, Georgia. NAKHE has given a President’s Award to one of its members only four times since its founding in 1897. It is presented to an individual who has exhibited exceptional leadership in the profession and in NAKHE. Estes’ interest in the field of kinesiology, which is the study of body mechanics, began when he was a college athlete. He rowed at San Diego State University, where he earned his bachelor’s and master’s degrees in 1982 and 1985, respectively, and trained and competed for U.S. National Rowing Teams during his time there. He received his doctorate from Ohio State University in 1990 with an emphasis in sport culture. Estes’ research interests include the relationship of mind and body in sport and physical activity, the philosophy of science in physical activity studies, postmodern sport, and the processes of leader development. He also is the author or co-author of four textbooks and numerous articles on leadership in kinesiology and the military. Estes has served two terms as the president of NAKHE. Among his accomplishments are participation in the organization’s leadership institute, the NAHKE Fellows Program, the Engaged Scholar Program, the Department Head Certification Program and the Leadership Mentor Program. His studies in military leadership led to a commission in the Tennessee State Guard, where he is a captain and currently serves as the public affairs officer for the Headquarters Company in Nashville.